Ray Miller, second from right, shares about his ministry in Toledo, Ohio. To his right is his wife, Betty. Also pictured are Tony Webb, left, executive director of VisionOhio, and Cheri Boehm, staff member with VisionOhio. Six couples who are willing to be involved in seeking God for new Grace Brethren churches in African-American communities in Ohio recently met to determine how to proceed. 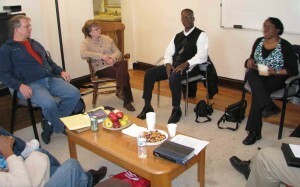 The group gathered November 20, 2010, in Dublin, Ohio, and spent time learning about each other’s ministries. The session is a result of the 2020 Future Story of VisionOhio, the regional Grace Brethren church planting ministry, which calls for a network of black congregations among the Ohio Grace Brethren churches. 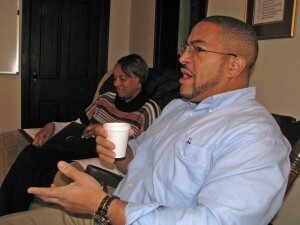 Stephen Joyce is leading the effort to plant Grace Brethren churches in African-American communities in Ohio. Participating in the November 20, 2010, meeting in Dublin, Ohio, were Stephen and Rosie Joyce, from About My Father’s House, Washington, D.C.; Ray and Betty Miller, Grace Brethren Church, Toledo, Ohio; Tyrone and Chari Curtis, Calvary Grace Brethren Church, Dayton, Ohio; Ron and Chery Boehm, VisionOhio, and Tony and Cathy Webb, VisionOhio. Stephen Joyce is leading the effort and the group plans to meet again in February 2011. Click here for a video of Stephen challenging the group.